At first glance Issa looks just like a stylish bar, but they offer a big and varied food menu as well. The interior is dark and chicly appointed, with tables arranged in a multi-level plan to take maximum advantage of the 29th-floor view. The food selection is eclectic to say the least (they advertise a mix of "Kyoto x Paris") - pizza, roast potatoes, Chinese dumplings, Vietnamese spring rolls - and all relatively inexpensive. 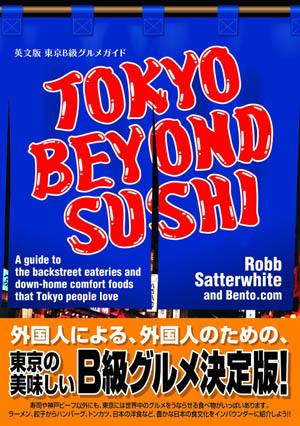 The roast potatoes are slow-cooked and soft, and the excellent homemade tofu provides the promised touch of Kyoto. The entertaining gyoza platter is also recommended - it gives you an assortment of ten different dumpling varieties (maybe 15 pieces in all) for Y2000. The most surprising things on the menu are Issa's original cocktails, which glow in the dark. Different flavors come in neon colors of green, blue and red. (There seems to be a tiny battery-operated device inside the ice cubes, but we didn't inspect too closely.) 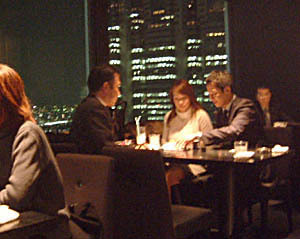 The effect is startling at first, but after you've gotten used to it the glowing glasses at nearby tables make a nice visual counterpoint to the far-off lights of Shibuya and Roppongi in the distance.